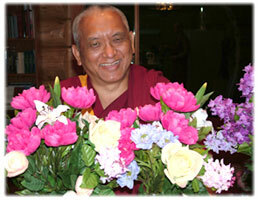 We hope to have more information about Rinpoche’s schedule in 2005 soon. ‘So as to give Anet (Ven Anet Engel) a break from cooking all the time for the house, I suggested that we go to town for dinner. Roger wanted to eat at the house, as she makes very nice food. So Roger asked Anet if she minded cooking. Of course if you ask, then the person will say that they are happy to cook. Of course it is possible to say no, but that would be quite rude. So Anet replied to Roger ‘that it mainly depends on you’. So from this you can tell that she wants to go out to eat. So we went out. But Roger didn’t realize that we were going to eat out, as I asked him ‘do you want to go shopping?’ And he replied ‘yes’. The reason to go shopping was to buy a vase and wealth for the seat of the Medicine Buddha statue at the house, and along with that to have dinner. The Breadline Cafe was where I met with the group of students during the last visit. But as it was almost closing time, maybe the waiters would be upset at having to delay going home, so we went to another restaurant called ‘Dairy Queen’. First of all I had an ice cream that was okay for diabetics, and then I was served a veggie burger and french fries. Then it came into the mind to eat the french fries whilst thinking Guru Deity. There were quite a lot of french fries, so with each one, can collect more merit than making offering to all the Buddhas, Dharma, Sangha, statues, stupas, scriptures, and all the holy objects. ‘Thank you very much your great news of your discovery of life, for yourself and others. Certainly it is a blessing of the Arya Sanghata Sutra, which means it is a blessing of Buddha himself, a direct blessing from Buddha to you. Rinpoche offered this advice concerning which texts to study together with new Dharma groups. Rinpoche was asked to advise which was more beneficial to study with this particular group: a Lam Rim text, a Lojong text, or Shantideva’s Guide to a Bodhisattva’s Way of Life. Rinpoche replied that it would be more beneficial in this case to study a Lojong text. The Lojong and Lam Rim texts were more beneficial for newer groups to study, as they gave the outline of the whole path to enlightenment. Shantideva gives more detail of this outline. So it is like with the news on the television, the main points are presented and then you can decide whether to stay for the detailed report that follows. So too with the Lam Rim and Lojong texts you receive an outline, and then you can choose to study Shantideva for more details of this outline. Rinpoche offered this advice concerning the practices of love and compassion. Rinpoche said that although we have different definitions for love and compassion, and during tong-len practice love and compassion are practiced at different times, actually, in practice they are not separate. Just as smoke is a sign of fire, and with a fire there is smoke, so too where love is present so too there is compassion. That in practice they are coming together. When you are wishing to take on the suffering of others sincerely, then you are also wishing for their happiness. And when you are wishing sincerely for others’ happiness, then you are also wishing to remove their suffering. Although the thought of love and compassion are not arising simultaneously, in practice they are appearing together.